MILWAUKEE--(BUSINESS WIRE)--The historic AAA Four-Diamond Pfister® Hotel, owned and managed by Marcus® Hotels & Resorts, today announced Rosy Petri as the hotel’s 11th Artist in Residence. Petri, a Milwaukee-based multidisciplinary artist, will work in the hotel’s lobby-level Artist’s Studio for one year beginning April 1, 2019. She is succeeding current Pfister Artist in Residence and fashion designer, Stephanie Schultz, who will culminate her residency with a couture fashion show on March 15 at The Pfister Hotel. Through her various mediums, including fabric portraiture, quilt-making, photography and mixed media, Petri showcases her passion for social justice, art and storytelling. She is most well-known for her series of quilt portraits of famous American musicians that pay homage to the country’s diverse history of music. Petri currently exhibits her work at the David Barnett Gallery and 5 Points Art Gallery and Studios in Milwaukee. She is also the owner of Milwaukee-based Paradise Home Goods, where she sells heirloom quilts, handsewn accessories, dresses and skirts, as well as candles and body butters. 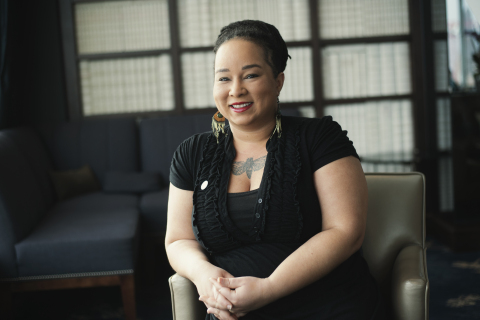 Petri has been recognized locally for her work, including being named a Milwaukee Artist Resource Network (MARN) mentee in 2018 and recognized with an artist award at the 2018 Bronzeville Cultural and Arts Festival. During her residency, Petri plans to create a salon and studio space that will highlight guests and other creators through portraiture and podcasts. Using her diverse talents, she will develop a collection of photograph and fabric portraits, as well as audio interviews to share individuals’ perspectives on the theme of “myths of creation.” More information about Petri’s work can be found at https://www.thisisparadisehome.com/. To celebrate the conclusion of her year-long residency as the 10th Artist in Residence at The Pfister Hotel, local fashion designer, Stephanie Schultz will host a finale fashion show on March 15, 2019 in the hotel’s Imperial Ballroom. Schultz spent the last year working on a collection of high-fashion and couture wear inspired by the hotel’s Victorian Art collection. This collection will be featured during the evening’s show, which starts promptly at 7:30 p.m. Doors will open at 6:45 p.m. Guests can also participate in a “Best Dressed” contest and enjoy a post-show reception. General admission tickets are free (VIP front row seats are already sold out). For more information about the show, please visit the Facebook event. Entering its 11th year, The Pfister’s Artist-in-Residence program features a working art studio and gallery that is open to hotel guests and visitors. The program encourages the public to interact with the artist and witness the evolution of each piece first-hand. The program’s most recent artist is Stephanie Schultz (2018-2019), https://www.silversark.com/. Past artists include Margaret Muza (2017-2018), www.margaretmuza.com; Pamela Anderson (2016-2017), www.pamelaandersonstudio.com; Todd Mrozinski (2015-2016), toddmrozinski.com; Niki Johnson (2014-2015), www.nikijohnson.com; Stephanie Barenz (2013-2014), stephaniebarenz.com; Timothy Westbrook (2012-2013), www.unicorns.carbonmade.com; Shelby Keefe (2011-2012), www.studioshelby.com; Katie Musolff (2010-2011), www.katiemusolff.com; and Reginald Baylor (2009-2010), www.reginaldbaylor.com. At more than 125 years old, The Pfister Hotel is one of the oldest and most prestigious hotels in the Midwest and downtown Milwaukee. Originally opened in 1893 by businessman Guido Pfister, it was the most lavish hotel of its time. The hotel’s storied elegance had faded following World War II, until 1962, when Ben Marcus, founder of The Marcus Corporation, purchased this grand hotel out of bankruptcy. The Marcus Corporation renovated and restored the hotel to its original glory, adding convention facilities, a parking garage and 23-story guest tower. The Pfister Hotel is home to the largest collection of Victorian art of any hotel in the world as well as an award-winning Artist-in-Residence program. Today, The Pfister Hotel continues its tradition of gracious service and impeccable style and has been recognized by AAA as a Four-Diamond property for 42 consecutive years. In 2018, The Pfister was recognized as a Top Hotel in the Midwest in Condé Nast Traveler’s prestigious annual Reader’s Choice Awards for the second consecutive year and was ranked the No. 1 Best Milwaukee Hotel by U.S. News & World Report in 2019. This exceptional property is a member of two prestigious hotel organizations, Historic Hotels of America and Preferred Hotels & Resorts. The Pfister Hotel is located at 424 E. Wisconsin Ave. in downtown Milwaukee. For more information, please visit www.thepfisterhotel.com and follow the hotel on Facebook and Twitter (@PfisterHotel).